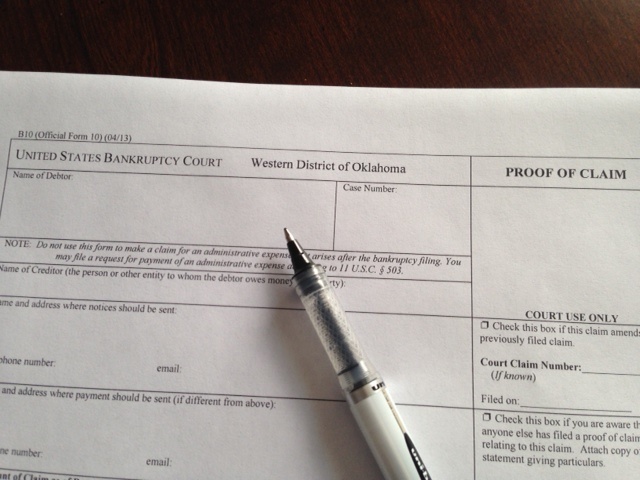 Bankruptcy is a legal proceeding designed to relieve debtors with relief from their creditors. A debtor is required to list all his assets, income and creditors. Most bankruptcies involve cases under Chapter 7 or Chapter 13 of the Bankruptcy Code. Unless a proof of claim is timely and properly filed an unsecured creditor will likely recover nothing. There does not appear to be any property available to the trustee to pay creditors. You therefore should not file a proof of claim at this time. If it later appears that assets are available to pay creditors, you will be sent another notice telling you that you may file a proof of claim, and telling you the deadline for filing your proof of claim. In the event that such assets are later found the Trustee sends a “Notice to File Claims” which will usually include a “Proof of Claim” form. Occasionally, the notice indicates that there are assets and may actually send a proof of claim. In this case the claim must be completed and filed within the deadline provided. Chapter 13: A Chapter 13 requires a consumer debtor to make monthly payments pursuant to a plan. The Trustee then pays claimants pursuant to the terms of the plan. Unlike a Chapter 7, generally creditors should file a proof of claim in Chapter 13 cases. This is especially true if the creditor holds a secured claim (a claim secured by a mortgage or security interest). The plan should provide for the payment of the secured value of the property. Filing and Deadlines: Before a claim can be paid it must be filed. An unfiled claim will not be paid even if the debt is acknowledged in the debtor’s schedules or plan. The deadline is the last date which a creditor can file a proof of claim. Courts are extremely reluctant to permit a creditor file a late claim. Therefore, it is critical for a creditor to file a proof of claim prior to the deadline. A debtor or trustee can file a claim on the creditor’s behalf but these instances are rare and are also subject to time limits. Amount: The amount of claim should be limited to the principal, interest and costs that exist on the date of the date that the debtor filed bankruptcy. Secured vs. Unsecured: Claims are either secured or unsecured. A claim is secured when the creditor has a lien upon property. Typical examples include car loans and mortgages on real property. Often stores retain a “purchase money security interest” in items sold. A creditor is considered to be secured to the value of the property. If the property is valued less than the debt owed then the claim is partially secured and partially unsecured. The existence of security may impact creditors differently depending upon which bankruptcy case is chosen by the debtor. In Chapter 7 case generally only the unsecured claims are paid because a secured creditor may look to the secured value to recover its claim. A creditor may want advice on how to proceed especially if recovery of the property is doubtful. Also, if the trustee is selling property secured property the underlying debt must first be satisfied. In a Chapter 13 case the debtor is required to pay the amount of the secured claim if the property is to be retained. Typically, the debtor’s plan states a value of the asset and that amount will be paid. For example, if a debt is secured by furniture and the debtor’s plan states that it is secured for $500, then that is the amount that the creditor will be paid. The remaining balance of the debt is treated as unsecured. The creditor will share in a pro rata portion of the remaining pool of funds. Therefore, often it is not enough to file a proof of claim but the secured creditor may also seek an attorney’s assistance to insure that the full value of the secured value is being paid. This must be done as soon as the Chapter 13 case is filed. Filing a proof of claim is generally the only way that an unsecured creditor can recover from someone who has filed bankruptcy. It is important to file proofs of claims properly and to be able to justify it if challenged.